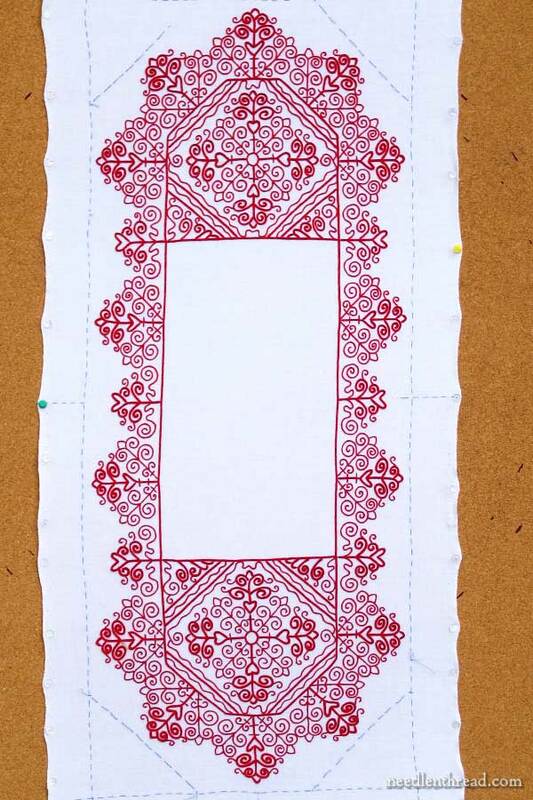 Moving towards the finish here with the Hungarian Redwork Runner! I hope I’m not going to shock you, but after finishing all the embroidery (even the last couple bits I mentioned the last time we visited the project), I tossed the runner in the washing machine. 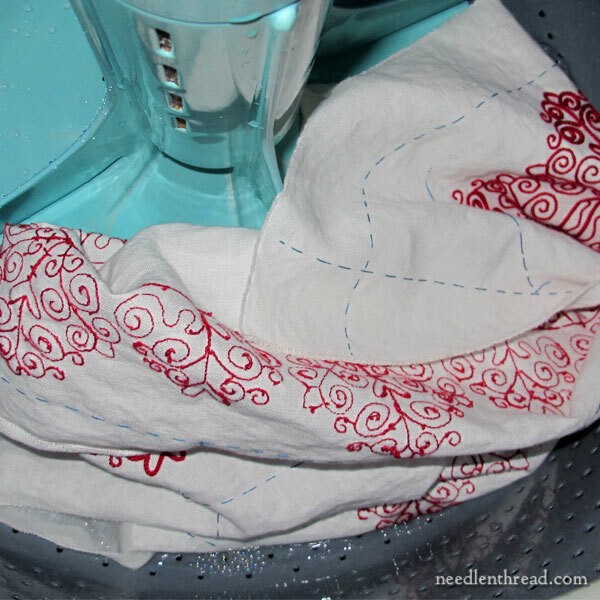 Yes, red embroidery, white linen, and the washing machine. Oh, and a bit of detergent. I didn’t really pause to wonder if it was a bad idea. See, the way I figured it was this: I made the runner for a dining table. Most dining tables in my range of experience undergo various activities, one of which is dining. And when dining happens, it is likely that any white linens on a table may very well get spotted. Most people who experience spots on their table linens don’t necessarily meticulously hand wash them. They put them in the laundry. Now was just as good a time as any, to test whether or not this piece would make it through the wash without incident. So I tossed it into my very old washer, along with a splash of Biz, and put it on a gentle cold water wash with a 20 minute soak. They didn’t. The white came out brilliant, pristine white, and the red came red, just as it should have. How did I know the red wasn’t going to run? Well, at the beginning of the project, I put an embroidered sample through a cleaning and ironing test, to make sure that the red threads would not run. Always a good idea, when you’re doing a lot of stitching with red thread! When I took it the runner out of the washer, I rolled it up in a towel, and transported it to my workroom, where I have a very large cork board, just waiting for projects like this. Onto the cork board went the runner. At first, I began pinning it like I do when I damp stretch any small embroidery project. But golly gee! It took about 70 pins across the short end of the runner. At that point, my thumb decided I didn’t need to pin it quite so thoroughly. So I pinned about every 2 – 3″. The piece was still quite damp when I stretched it. Once it is completely dry, I’ll give it a good ironing, cut off the excess around the edges, and hem it. Originally, I wasn’t sure if I would hem the corners on an angle, following the shape of the design, or if I would hem the piece with square corners. The edge of the piece could possibly be worked with a red decorative stitch, but I think that would be overdoing it. Right now, my plan is a hem with a drawn thread area – something very simple, like regular hem stitch. The edge is a little close, the Photoshopped version is a bit wonky, and the red on the edge is a little more solid than it would be, stitched. But still, it gives a general idea of what the runner would look like, if I took the angled-corner approach with a red edge. Ehhhh. I don’t like very much. One thing I love about this runner is the crisp white of the ground fabric in contrast with the red embroidery. To get the best effect of the contrast, I think the corners should be square to give it some room, and the edge should just be a simple white hem (perhaps with some hemstitch). What do you think? You’re most welcome to weigh in with your opinion below! In any case, it may or may not be finished by February 14th. I’m shooting for that, but I won’t promise! January 22, 2015 Hungarian Redwork Runner … It’s… It’s…. I’m curious as to why you didn’t do the hemstitching first, before you washed and ironed the piece. Hi, Theresa – Once a piece like this is blocked, stretched, perfectly flat, it’s much easier to do the hemming and finish work, to measure, cut, withdraw a thread or two, etc. I completely agree with you; square corners and white hem will be beautiful. The red needs more white background. A red hem would distract. It almost looks too cluttered. Beautiful work Mary …. As usual !!! The table runner turned out beautifully. And I will use your testing procedure for my next table linen. That’s a plus for DMC colors. I was wondering if there was any way to “set” over-dyed threads so that they could be used on table linens. Soaking in vinegar water? Have you tried it? I received some hand woven wool placemats from Peru and when washed by hand the colors ran, so they are ruined. I’ve used a diluted vinegar solution, and it has helped. I don’t always trust those kinds of “fixes,” though…. You can buy stuff in the supermarket that will remove the colours that ran, restoring your piece to its former glory (or so they say). Sorry I can’t remember the name of the stuff but the dyemakers (Rit and Dylon) make it so you should be able to find some. It worked for me on some kids’ gear I wrecked. Good luck. It would be a shame not to save your placemats. Glad to see you’re almost finished, Mary, and the piece is stunning! 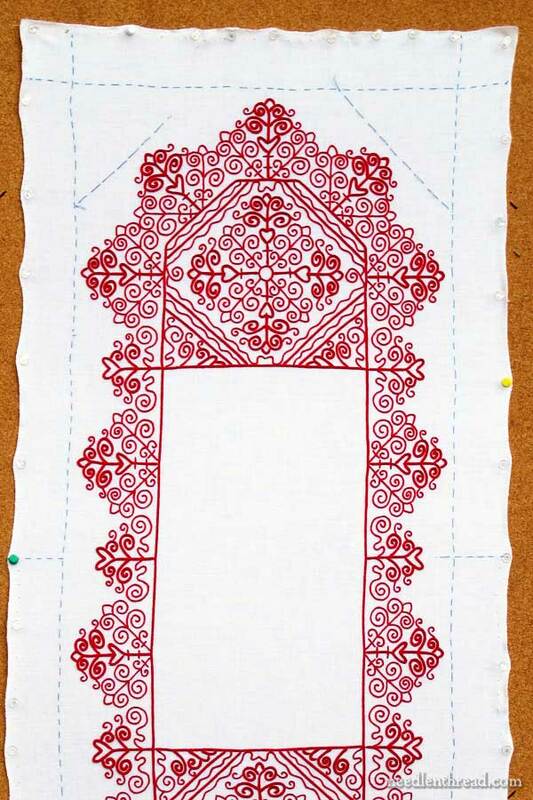 I think you are right to square the corners and do a simple hemm in white, but drawn threadwork might be kind of lost with all the bright red and , therefore, not worth the effort. Hi, RJ – I probably should have clarified – by drawn thread, I just mean one or two threads drawn, to make it easier to do the hem stitch and give it a finished look. I always find it much easier to hem a linen that has a thread or two drawn out. Hi Mary…The piece in itself is just stunning! To me, the red edge detracts from it. I’d go with a white, squared, hemstitched edge. Congratulations on your beautiful work/piece! Edge with red!!! In my opinion, edging with red and using the angled corners will give the project a more finished look. Use a bit more of white in the margin than used in the photo shop sample but go with red. The white hem stitched and square corners just look unfinished; almost as if you lost interest in the project and hurried the finish. I love red to begin with and the angled corners just cry out for attention. Which ever way you finish, it’s a lovely job. Good point, Bobbie. The table is dark…. I prefer the photoshopped version, but I am also a quilter and I like my work to have a border or frame around it. I admire your courage for putting the runner in the washing machine. I would not have had the courage to do so! I like the idea of the shaped runner, but with more white border around it than your photoshop mock-up, and no red outline. Another idea, a scallop edge that echoes the shape of the embroidery. The scallops would mimic the shape of the hearts,emphasizing the valentine motif. I really like the angles with the red edging. absolutely beautiful. You are simply the best. Love all your work and tutorials etc. I’d go for the square. I feel the embroidery at the ends needs some breathing space. I think mitring the corners would not show the embroidery to it’s full effect. It would suffocate it. Also the inside has squared corners and I feel it would confuse the overall look if they were different. I’m proud of your runner. Kinda feels like theirs a little bit of me in there too after watching it (no, I’m not thinking ‘for so long’!) almost stitch my stitch. It’s beautiful. I think I would actually like square corners. However – this is a table runner that you will put on a table with dishes and plates and all. The angled corners will work better in that setting. And still look FABULOUS. Go with the simple hem stitch and square corners – just as you said. I’ve never responded to your questions before because I’m a rank beginner without enough time to do embroidery now. But I just had to respond today. I think you should let your embroidery stand on its own, without additional work—just a simple hem. Just my two cents. Absolutely beautiful! I vote for the square edge, white hem. The white really sets off that vibrant red. Well done! it looks beautifull and I like it very much, you did a great job. My ideas about finishing: the design is so nice, it needs some breathing space, so I would go with the rectangular. Maybe even make it a bit wider than you originally planned (where the tacking stitches are). The design needs the quiet white fabric to shine. And it would also echo the rectangular middle part. Just finish the hem with white stitches, don’t take the attention away from the middle (the star of the show). Hurrah for a finish! I’m not getting any needlework done, so I may as well celebrate yours :-). I may have missed this, but what shape is the table? If rectangle, then square corners will work well. If oblong, then I’d go with diagonal corners. Just my preference! I wonder – do they make blocking wires for needlework, like for knitting (used to avoid using millions of pins) ? Would the knitting ones work, or would they be to big? I vote for the angled edges with lots of red! It looks great! Mary, I totally agree with you on the square corners and hemstitching. It’s such a nice finish for table linens and will enhance your other handwork on this piece. To my eye the red satin stitch edge detracts from the beautiful redwork and makes it look commercial. Okay, that’s my opinion weighed in! No red border, it gives the piece a heavier look taking away from the delicacy of the work. Beautifully done. You are a brave lady – even with tests done beforehand, I’d be worrying while it washed. I also prefer the simple squared white hem to the red edge. The pattern is very busy. A calm, plain edging sets it off nicely – and no risk of the diagonal sections stretching with use, either. I like the red edge and the angle cut. Since most runners are cut with square corners I think it stands out more with the red edge. I am undecided. I think I would love the piece either way. And I just love white and red. I’ve got a little book with cross stitch household linens in white and red. I just love to flick through it and someday I will adapt some of it in a different stitch. I hate to disagree with you, but I like the angled corners. I don’t really like the red edge, but I like just the angled corners. But do whatever you want with it! It’s your embroidery! And whatever you do I know it will look fantastic when it’s done :). P.S. You haven’t added any of the articles on the Runner that you’ve posted to their index since May of 2014. Is there a problem? Or am I just doing something wrong? i love it. But I think those corners may be a little too much white. Can you get away with some red tassels at the corners, or will they get on the way of the intended use? I like the shape of the edge, it follows the interior design. To introduce a rectular vshpae would make it busier and confusing. This shape keeps it neat and comfortable! I would though move it out about 1/4″ more. Good luck. It is a beautiful piece of work. I think we may have all gasped (!) just a bit when we read that you put this amazing piece of red work in the wash!! I was happy to read that you had pre-tested the red thread earlier. It is just stunning and I like your idea of a simple rectangle and let the center stand on it’s own. I think the angled corners detract from the redwork and make it look too “busy”. In any event, it is just beautiful!! Thanks for sharing this lovely work with us. I always love to,read your posts – they are so interesting and I learn so much. Thanks for sharing your knowledge with us. Absolutely beautiful. I think the plain hem without the red edge is better. Keeps the focus on the redwork design. And thanks for your follow through in demonstrating the washing and blocking. I would have hemmed it before washing and but as always your experience speaks of greater wisdom. Thanks so much! It looks lovely and I’m so glad you finished all the chain stitch on it and that all you have to do is the edging. The answer to your question about angled or square edge, I don’t know I would have to see it up close to make a comment, it’s ashamed you don’t live close by I could pop by and have a closer look. I will leave the angled vs square to your expert eyes and whatever you decide I’m 100% sure it will look gorgeous. I can’t wait to see it gracing your dining table you must take photos. Good Luck. So glad it went through the laundering well. Beautifully stitched. I think I would prefer the angled corners with a touch of red around the hem. I think the angled corners would compliment the design and give a more unique and custom finished look. Every time I see this piece, I smile. I think it’s my favorite of everything you’ve shared with us. In fact, I am working on a fabric-covered box, and have adapted your table runner design for the box. Cannot wait to see this piece when you’ve finished it!! I find it incredible that you can use Photoshop to “try out” an idea on your embroidery so you can “see” what it might look like! 50 years ago, when we did not have this technology, you might have stitched the red all around the edge and then hated it! With this software, you can play with different options before you commit to a choice! Isn’t it extraordinary!!!! Squared ends with maybe a rolled hem? I think the linen is too heavy for a rolled hem. I thought that about that when I was considering the Hungarian edging (kind of a triangular buttonhole stitch), but rolled hems work better with a finer fabric, I think. Oh, how absolutely crisp and lovely. I opt for square corners and white on white stitching so that the red embroidery pops, as it should. I have learned so much from this site and enjoy you hometown way of putting things. If I ever come to Kansas expect me for a cup of tea. Love, love, love it and I agree about the squared edges. It’s beautiful. I also like the idea about using cork board to block the piece. Thank you for sharing this lovely piece. You’re getting a lot of feedback, and whatever you decide will be beautiful, as your work always is. But I’ll insert myself anyway. I love the angled edges, and a red hem that is similar in thickness and echoing the red that surrounds your heart motifs and the inner rectangle. It could be a little further out if your blue guidelines are basted rather than permanently marked. The angles just finish the look nicely and keeps the eye moving around your lovely embroidery, rather than sliding off the edge of the piece. I also love that you do give yourself deadlines but don’t beat yourself up when you extend them! So smart and easier on yourself! I like the white hemstitched option, classic, clean, not distracting from your many hours of work. Let the embroidery shine forth. I have to totally disagree with you on this one. I clean vintage and antique linens for customers and also finish needlepoint and cross stitch projects for them. Unless it is the Biz which is acting as a bleaching agent, red is too dangerous to use. Just last Christmas, i warned a customer about washing a cross stitch stocking before finishing, but she did and it bled! Also, I prefer putting any needlework in a mesh bag. A lot of vintage linens, especially lace work are totally ruined by the wringer action. Let me clarify: Red is too dangerous to wash. I suggest dry cleaning or treating the threads prior to stitching. Red dyes can be too unstable and the chance you take is very costly. Navy is the same. I also agree with you. And Congratulations!! It’s beautiful! I’d draw one or two threads, hem it in a rectangle with a 1 to 1.5 inch hem and do a red blanket stitch to secure the hem. A small bit of red to highlight the redwork. But really you could finish it any way at all. You couldn’t spoil it. It’s lovely! Gosh! Lots of opinions, well here’s mine. You’re right about the red edging. I feel it contains the design and makes it look squashed. I like the idea of the angled shaping. Square runners border on the “ordinary” even if the embroidery design itself is SPECTACULAR! Shaping will enhance a square table. A square table with a square runner will diminish the embroidery. Really. Especially if the dining table is large. Mary, in my lowly humble opinion I like the photo of the angled corners and red edging. wondered if I was on the right track. Thank you for making up my mind for me and I will try to get a photo to you when all is done. We are having our bi-annual exhibition on 7th March so I had better get a move one, Thanks and kind regards,Ena. The piece really looks great, but I would vote for the angled corners. Then the amount of space is the same all the way around. But either way, it will be a great piece on your table. Take it from a quilter — Shout Color Catchers. Hate the ads — wash all your lights and darks together! Made everyone think what a dumb product and waste of money… but for crafters — we do a lot of stuff with vibrant colors and lights and darks all together…. this is the product for us! The red edge is TOO much! A simple white hemstitch sounds good with a good inch of white fabric around the embroidery if you have enough fabric. Either square or angled corners would be OK for me, but it would be easier to do square corners so that’s probably what I would choose if I were making the piece. This has been a very interesting project to watch you develop! 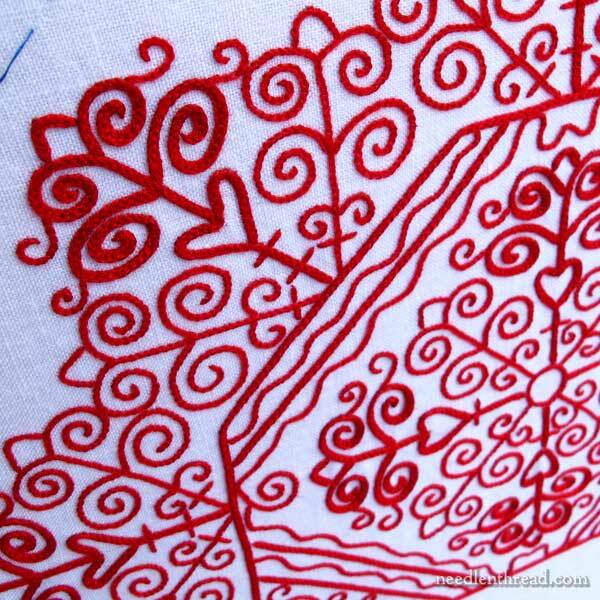 Because of the intricate design of the redwork, I think a red hem would make it all look too squashed and squeezed. The outside edging of the design needs to stand on its own, it is too beautiful to be boxed in. Square corners with drawn thread hemming would be perfect. I do drawn thread work myself and it can be as simple as you need it to be to make a perfect border that won’t fight the main design. On a dark table, the white border would stand on its own and the red would pop. No angles needed, the interior white rectangle would complement the square edging. Gorgeous work Mary, I know how many hours it took. Looking from above I can see that rectangular with a simple hem looks nice. But when I try to visualize it at an angle as if I were sitting at the table, then at least in my imagination the angled corners work better – though with more white around the pattern and a narrower red edge. Mary I love your red work runner with its beautiful embroidery. I agree to keep the edging simple and let the embroidery be the focus. Dear Mary, The embroidery is outstanding however you decide to display it. I love the red edge but only with a wider border between the embroidery and the edge. If your table has a dark finish then you could used a white table cloth under the runner. It would be like a “double frame” around the embroidery. But that’s my 2 cents worth. I like the angled and I really like the red edge. One thing about the red edge is, it grounds the beautiful work on the inside. So your eye is immediately drawn to the detail. Without the red edge it just floats. I think I would like to see a squared corners with white hem stitching. I kind of like it as photoshopped. Maybe without the red edge. Either way will be beautiful. Congratulations. Your work is beautiful. I agree that more white to set off the red is a good idea. More red would just be overkill. The sides especially lose some of their flow with the red line of stitching guiding the eye instead of the redwork. It’s a lovely piece of work and I’m pleased it survived the washing machine. In my opinion, if you can make the runner larger so that there is more white around the whole thing, then a red edge would look good. With the size as it is, it looks too crowded. Even with a simple white hem, I would make the whole thing a little bigger all the way around but keep the angled corners. That way the whole thing can breath, not just the corners. For one thing, a red border would just be too much red. (Who knew that was even possible?) And if you angled the corners, not only would you lose the white ground that allows one’s eye to rest from all the red and from the pattern, but you’d lose the opportunity to repeat the white rectangle in the middle. I think repeating the rectangle is a necessity, otherwise the rectangle would look too…boxy… all by itself, as if it’s not even a design element. Also, thanks for sharing some personal details recently. I’ve wondered how one comes to be writing a blog as a full time occupation. Strangely, I’ve been motivated to eat bananas every day since I read about your feelings for them. It’s been a nice change of pace. I think you are correct in what you are saying about the weight of red against the white. I think you should have a rather wide border of white around the stitching, with a simple white hem, because without the contrast of the white, the red patterning tends to blend together into a large mass. You have a large white area in the center, so to have a narrow border would make it seem off. Square corners and single hemstitch will keep it elegant and classy and in line with the internal corners. Looking forward to seeing it on the table. Just my humble opinion, I admire you not babying it and instead have prepared it to be used and enjoyed. I think it’s such a shame that so many beautiful objects are kept “for a special occasion” and never see the light of day… I think all things should be used often and if they don’t last… well what beautiful memories they made. At the start of the blog today my heart leapt at the horror of a pink streaked runner! Should have known! And it’s your quirky sense of humor that never let me doubt you as a real person writing single handedly. I like the drawn thread with crisp square corners idea. Thanks for your lovely work that you share. drawn thread and hemstitching would be lovely! I’d go with the rectangular shape and consider a little motif in each corner that reflects the heart and squiggle (the bolder design in the body of the work that has a heart + 4 squiggles). Just an idea. If you get a color copy and lay it on each corner 1st you could see if it works. You must be so glad to be near the finish line. It’s beautiful! Hello Mary, Thank you for considering my suggestions. It seems to me that it would look better with a double hemstitch, as far away from the red embroidery as possible, You’ll embroider it magnificently . Love the square corner idea. Love the red edging because it acts as a frame for the whole piece. Whatever you do this is a beautiful stitchery piece. Thanks for sharing. It’s gorgeous, and it will remain gorgeous however you finish it. Mary, trust your own judgment: I’ve never seen you take a wrong step. My own preference? It doesn’t look as if there’s a huge margin to play with, so I’d go with rectangular and white; if you had a wider margin I’d angle the corners (I? I don’t have the skill!) to reflect the shape of the emboidery, but still white. It is lovely. I like the simple white drawn hem. Can the runner be worked with the Tambour needle? I love this site ,it usually leave me drooling. Hi, Juliet – the chain stitch part could be worked with a tambour needle. I tried it about half-way through, but since I had already started with a regular needle, there was too much of a difference in the size of the stitch, so I stuck with a regular needle. But if you started from the beginning, yes, the chain stitch part could be tambour. Looking good, but agree squared off. It shouldn’t have run on a cold wash, but if at all worried, add salt to the water. Don’t know what Biz is. Happy stitching and where the hell do you get the time. I sat for ages yesterday, yes I know I am still in the learning stage, but I figure that will go on for the rest of my life, and got very little done. Today I am off to stitch a month, then tomorrow it is onto a challenge I am doing through a facebook group. I like angles! You’re right that a heavy red edging is bad, though. Perhaps you can angle while also doing a clean edge finish? What a lovely piece. I’m not sure that I have patience to work so much in one color, but I am certainly coveting your table runner. This is gorgeous Mary. Even though it isn’t really my “thing” I can admire the skill and artistry that has gone into it. FWIW I agree about the square edges and white hem. Any more red would be overkill. I could very easily see this piece as a large oval. Also, have you considered using a mixed color edging (variegated red and white) for the edging? I absolutely love your work and wonderful advice. Personally, I like the angled corners. I like the way it follows the work. It also gives you a little more area on the table for someone’s glass or cup. I don’t think the red hem does anything for it. White would be my choice. Are you going to fold (3 times)and hem it, or do a decorative stitch (nun’s stitch or something) and cut it off even? I love the red border and the angled corners – it makes it look finished and for me causes me to focus on the embroidery rather than my gaze wandering off the piece to other things. I don’t do an awful lot of embroidery but love seeing the work you do and so happy that this art is being continued in the 21st Century. Definitely with the square edges. The expanse of white makes the redwork sparkle. Its going to look lovely. Definitely rectangle. It works with the center rectangle. Very inspiring piece. Thanks for sharing. Definitely square with a simple hemstitched edge to let the red embroidery, which is what this piece is all about, sing the solo. I agree with you, I think it would be the most versatile on a table top. Very beautiful! Tiny bit worried about an uncovered cork board! I presume it is sealed; hate to think one day you leave it on damp overnight and….!!! My Christmas table cloth even has (admittedly DMC type)gold-working on it and after Christmas it just gets chucked in the “synthetic” wash. Survived so far with just a soft iron to get it ready for next year. It looks magnificent! I concur with you. 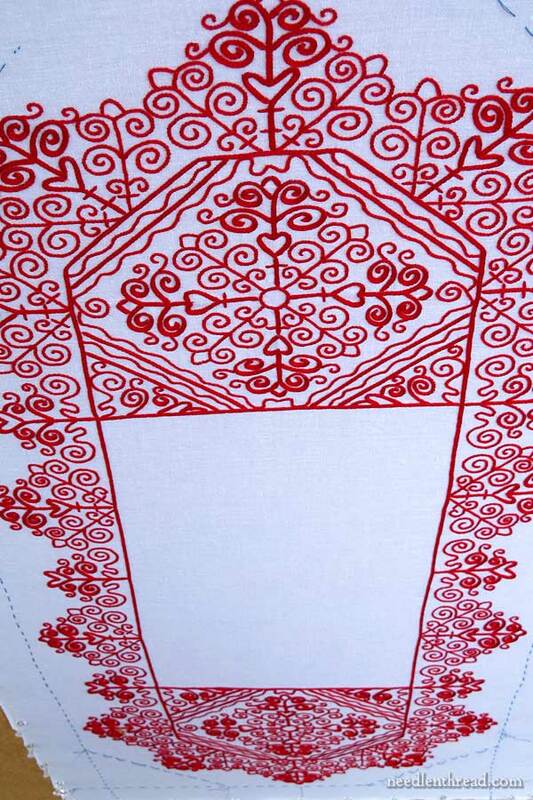 A border of white and simple drawn hem edging, allows the fingers of red filigree embroidery freedom. I think this piece asks for a bit of gold edging! It seems like it would add to the luxurious feel this piece has. Good work, Mary! This is beautiful. I would have like more white around the embroidery – would have balanced the large white rectangle. I’m thinking square with red on the outside to mimic the rectangle in the center. Well done Mary ! This is really beautiful work. I have a very large Hungarian tablecloth that is the typical embroidery work with many bright colors. I have had it at least 14 years, kept it covered with plastic – but over the years the edge has become soiled by many small hands (grandchildren). I want to wash it, but when I tried a smaller piece in cold salted water, it bled. Do you have any suggestions? Any help would be much appreciated! Previous Previous post: Crewel Intentions x 2 & Beginner Blackwork & Thanks!